That’s right: Like the Hollywood studios of old, like the stodgy makers of console games before it, Zynga, the San Francisco-based publisher of social games like CityVille, Mafia Wars, FrontierVille, and FarmVille, is inevitably going to get into the sequel business. Zynga has been a phenomenal success story with continuing growth, incredible profits, and big investments from major players. If things continue, it will soon be the most valuable gaming company — even though it’s still privately held and rivals like Electronic Arts and Activision Blizzard are publicly traded. Despite the carping from some corners, Zynga’s success is well deserved, as it figured out the twin precepts of the new era of casual gaming: incremental gameplay through virtual-good acquisitions and asynchronous cooperative gameplay with friends. At some point, each simulation game hits an end. A farm or city becomes too large to manage. Zynga has stayed ahead of this problem by continually feeding new simulation games to the market, but we are very close to the point where moving on to yet another simulation becomes tiresome, just as the wave of simulation games in the 1990s ranging from roller coasters to railways to the Sims eventually faded away. Entertainment is entertainment. Even Hollywood movies go through waves like this. In the late 1980s and early 1990s there was a wave of movies glamorizing competitive professions. What started out as great movies like Chariots of Fire that featured runners moved on to average movies like QuickSilver that featured bike messengers, and then quickly degraded into Over the Top, with Sylvester Stallone starring as a professional arm wrestler. After shaking itself off, Hollywood went back to the staples with movies featuring cops, firemen and lawyers. So what should Zynga do now? It has completely mastered social gameplay and the launch of new social games. Its titles, even after declining, dominate the social gaming scene, with four of its titles totaling up to 202 million monthly users. However, as the fast cycle on CityVille from launch to massive growth to decline, all within 3 months shows, perhaps another simulation game will not maintain sufficient momentum to sustain Zynga’s growth. As I pointed out last May, the answer is gaming franchises. It is useful to see how previous generations of entertainment companies handled this problem for a taste of the future. Rather than inventing yet another first person shooter, Activision Blizzard revamps an existing franchise, Call of Duty: Modern Warfare 2, with new graphics and gameplay, and hits $1 billion in sales within three months. Zynga is sitting on multiple gaming franchises that are seriously due for graphics and gaming refreshes: Mafia Wars, FarmVille, and Texas Hold ‘Em Poker. Each of these games has an audience that has played it before and would be very willing to check out a new version. 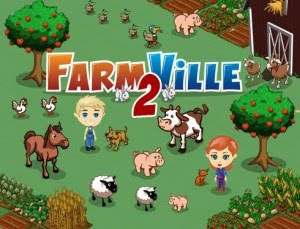 Just when you thought FarmVIlle would go away, here comes FarmVille 2!